Six unusual, wildly characterful plugins with a gutsy sound and lots of fun factor, though it's not for surgical tweakers. Variety of 'immediate' effect chains. Good combinations of useful effects. Unique EQ. Rude, unsubtle results. Great for beginners and pros alike. Won't give precise control, No compressor or delay chain. "What makes this one stand out are the processors you can switch in after the delay"
At the top of the Delay plugin are the regular controls that you'd expect to find on any modern delay unit: left and right tempo-synced delay times, feedback, filters, mix and a switch for linking the two channels. The delay itself sounds OK, but then it doesn't purport to be a vintage tape emulation or anything like that. No, what makes this one stand out are the processors you can switch in after the delay. These are the sort of effects Manny routinely adds to his delay chain using individual plugins or hardware, and here we have them very much 'in a nutshell', with simple 'more' or 'less' controls and immediate sonic wow factor. For example, the reverb section, with its Size slider and Level knob, sends the delay off into a generic digital hall, and sounds great doing it. The other effects are Distortion, Doubler and Phaser. It's rude, simple and brash but enables interesting, high quality sounds to be made in no time at all. A trick has been missed by not adding a compressor sidechained from the dry input to give the option of reducing 'delay confusion', but otherwise, it's a joy to play with and comes with plenty of presets to get you started. The Distortion plugin doesn't have much in the way of additional multieffects, but it does include a basic EQ for controlling the shape of the signal going into the distortion engine. Actually, it's more of a tone control than an EQ: high and low shelves, a semi-parametric mid band and a low-pass filter. There's no mention of frequencies unless you refer to the manual, with the knobs simply ranging from 0-100. Positively anti-geek! The big central Drive knob applies the actual distortion - the higher it goes, the angrier it gets. Attack and Release controls break the distortion in and out gently if you need it. The sound is a full-on dirty fizz with no subtlety, and it's always quite a bright distortion, but that's clearly the overall vibe with this whole collection. A loveable rogue. "The EQ plugin has been cobbled together from all the best bits of the EQs that Manny uses"
After the unorthodoxy of the Delay and Distortion, EQ at first comes as something of a disappointment, looking like a thoroughly ordinary EQ, despite the hippy print background. But look under the bonnet and the irreverence continues, for essentially, the EQ plugin has been cobbled together from all the best bits of the EQs that Manny uses. The cutoff points and Q shapes have all been lifted from the following units: Neve 1073, Quad Eight (used at Motown), SSL 9080 XL K, API 550B and Avalon 2055. The high frequency band, by way of example, is modeled on the Avalon, because Manny loves its silky 'air'. There are four bands available, each with five notched centre frequencies and up to 10dB of cut or boost, plus low- and high-pass filters. Some of the bands overlap for extra flexibility: you can cut at 250Hz on band 2 and boost at 110Hz on band 1 to create a heavier bottom end without clouding. Even the cutoffs are mixed and matched from the source models - the upper mid band actually borrows from three different units, for example. The results are impressive, particularly at the top and bottom ends. The reverb, despite its broad range of types, sounds mediocre at best, and you'll almost certainly already have better in your arsenal. But what makes it a worthwhile inclusion in the collection is, again, the chain of effects that come after the reverb itself. Your options this time around are Phaser, Distortion or Compressor (or any combination thereof), and you can quickly and easily pile them on to create interesting and unusual sounds that would normally take an age to set up. The compressor over the reverb path is useful to pump energy into the ambience, but what's missing here is the facility to route the dry input signal to the sidechain. That way, you could get some much more interesting pumping and breathing on the reverb tail. "Triple D is the most interesting conceptually, and possibly the most useful"
Of the six effects in this collection, Triple D is the most interesting conceptually, and possibly the most useful, too. It's a dynamic EQ that allows you to take down three problem tonal areas when they reach nuisance levels. Those three areas are boxy mids, harsh presence frequencies and sibilant high frequencies. The three Ds, then, are DeBOXY, DeHARSHER and DeESSER, and each band has a threshold control to set the level at which its problem frequencies begin to be attenuated. Each comes with its own Listen button, allowing you to hear each band in isolation and tune into the particular problem frequencies of the mix you're working with. Exactly where those frequencies lie is determined by the Freq sliders, and as with all the other plugins in the collection, the range is relative, from 0-100 - you have to go to the manual to find the actual frequency ranges. Interestingly, and maybe inadvertently, this is actually a good thing, as it makes you use your ears more than you might normally. Engineers commonly fall into 'frequency habits', always going to certain frequencies to cut or boost. 400Hz is a common one for cutting, as is 250Hz, while 2kHz is a common one to boost, especially for newer engineers. Relative sliders, like the ones here, force you to use your ears to find the tone you do or don't want. Tone Shaper is Manny's multiband parallel compression beast, designed to tweak the tone of a sound in a way that EQ can't. There are four bands, each with a choice of three different frequency centres around which to focus the compression. Each band is compressed more as the slider is moved up, with the effect of lengthening the release tail. Auto-gain brings the balance back, and the end result is a more dominant band. To all intents and purposes, it's EQ via a different process, and it's particularly good at delivering bottom-end weight and mid-range punch by compressing those bands and mixing them back in with the dry signal. 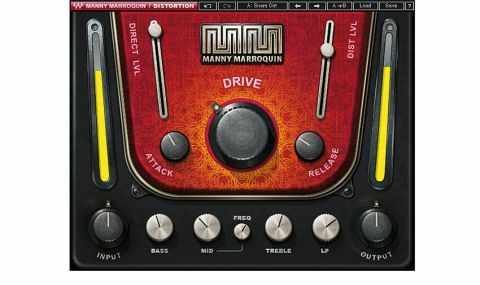 The Manny Marroquin Signature Collection avoids being the jack-of-all-trades that it might appear to be on paper by taking an irreverent attitude to classic processors, with the extended effects chains of Delay, Distortion and Reverb working quite brilliantly. They're certainly not subtle, and there's little finesse to be had, but all six plugins inspire invention and deliver immediate, brash and spectacular results. All hail the thug!